The Tar Sand Blockade as they are known, first came to light about a month ago when they advanced the brilliant idea of chaining themselves to construction equipment in an attempt to halt work on the job-creating Keystone Pipeline project. The idea to protest by chaining oneself to bulldozers is all well and good - except that they had inadvertently chained themselves to equipment that wasn't being used. Not to be swayed by embarrassment and/or reason, the Tar Sand Blockade is back at it again, recently organizing training sessions to teach other activists how to sit in trees, seeking out assistance from well-known scientists (emphasized for sarcasm) such as Daryl Hannah, and frequently tip-toeing the line between civil disobedience and legitimate security risks. Indeed, the environmentalists have taken to a new tactic for their protests known as 'tree sitting', a complex activity which nicely compliments the aforementioned 'equipment chaining'. 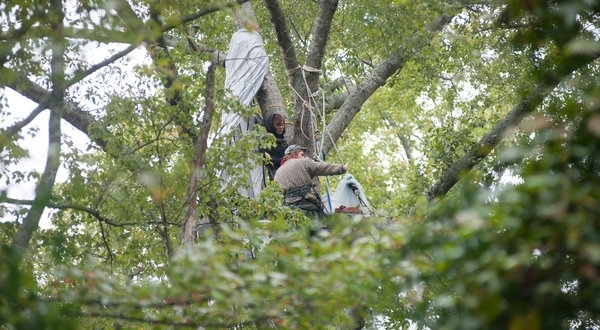 The Washington Post reported that after a weekend of rigorous "nonviolent civil disobedience training", the protesters took to a swath of trees in an area already cleared for the pipeline, climbing nearly 70 feet off the ground, and perched themselves on the branches in an attempt to physically sit in the way of progress. The 'tree sitters' as they are known have developed a virtual vegetative community amongst the towering branches, creating "a web of tree houses, structures and pulleys", and surviving on canned food and water, whittling away the hours immersed in books ... presumably made from trees. And while petitioning the government and filing lawsuits has seen little success for the group, they have armed themselves with the intellectual firepower of well-known environmental scientist actress, Daryl Hannah. Hannah has organized and instigated events that frequently cross over from simple civil tactics, to efforts that pose security risks to the protesters themselves, as well as others. The Post highlights one day in which activists chained themselves to a truck, and another in which they stood directly in the line of construction site bulldozers. The increased dangerous behavior has led to multiple arrests. One week ago, nearly a dozen individuals were arrested for chaining themselves to heavy equipment, while earlier in the month Hannah and east Texas landowner Eleanor Fairchild were arrested and charged with criminal trespassing for standing in front of excavation equipment. Aside from the ever-present danger, these environmentalists are incredibly misguided, adopting a policy of hugging (or sitting) trees, all the while trying to aid the far-left in putting a stranglehold on a badly needed boon for energy independence and jobs. The fact is, 10 federal government agencies have independently studied and approved Keystone - including the Environmental Protection Agency (EPA). Additionally, a report earlier in the year indicates that the Keystone pipeline would actually pose less of an environmental danger than pipelines currently running in the U.S.
Several energy experts who represent the oil and gas industry say the controversial Keystone XL, a 1,700-mile pipeline that would run from Canada to Texas, poses less of a risk to the environment than the estimated 50,000 miles of crude oil pipelines already crisscrossing the U.S., a network they say is safe and efficient. The report also cites the new pipeline's state-of-the-art technology as being improved safety-wise, as well presenting the alternative to a pipeline - hauling oil by tanker, truck, or train - as a far more perilous environmental risk.While the Tar Sand Blockade is skeptical about their own potential success at blocking Keystone construction, their efforts to place trees above a potential 20,000 new American jobs seem ill-informed, immature, and easily ridiculed - a basic tenet of the far-left environmental crowd. When will these groups scurry down from their tree homes and start putting people over plants?